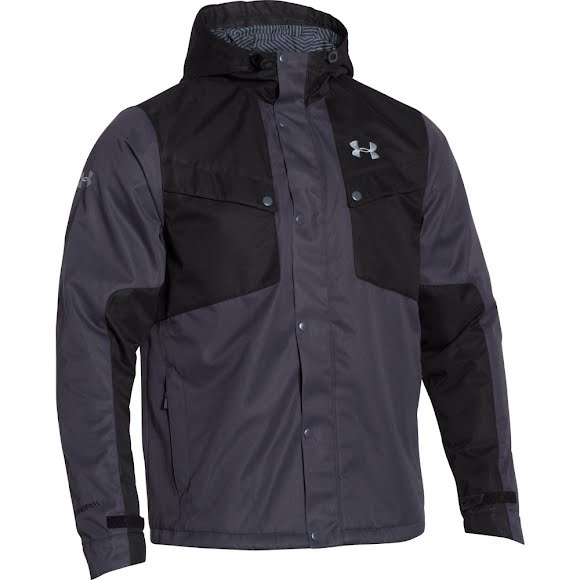 Stay warm this wintet without having all the bulk with help from the men's ColdGear Infrared Bevel Jacket from Under Armour. This jacket features UA Storm gear that uses a DWR finish to repel water without sacrificing breathability as well as having PrimaLoft Black insulation is lightweight, breathable & can be compressed without losing warmth. Stay warm this wintet without having all the bulk with help from the men&apos;s ColdGear Infrared Bevel Jacket from Under Armour . This jacket features UA Storm gear that uses a DWR finish to repel water without sacrificing breathability as well as having PrimaLoft Black insulation is lightweight, breathable & can be compressed without losing warmth. PrimaLoft is a patented ultrafine microfiber blend that is incredibly soft, lightweight and water repellent. PrimaLoft synthetic insulation absorbs three times less water, is 15% warmer when dry and is 24% warmer when wet that the closest competitive insulation. In addition to these impressive thermal properties, PrimaLoft is lightweight with a down-like softness that adds comfort and appeal. ?Durable Water Resistant (DWR) finishes on fabrics and zippers give long life to waterproof technologies. The addition of an enhanced hydrophobic treatment enables the DWR to adhere to materials for an extremely extended lifetime. For when it&apos;s cold! Keeping athletes warm and dry with high tech, lightweight materials. Ideal use: Temperatures under 55 degrees F. ColdGear features a double-sided fabric that wicks moisture from the skin and circulates body heat.